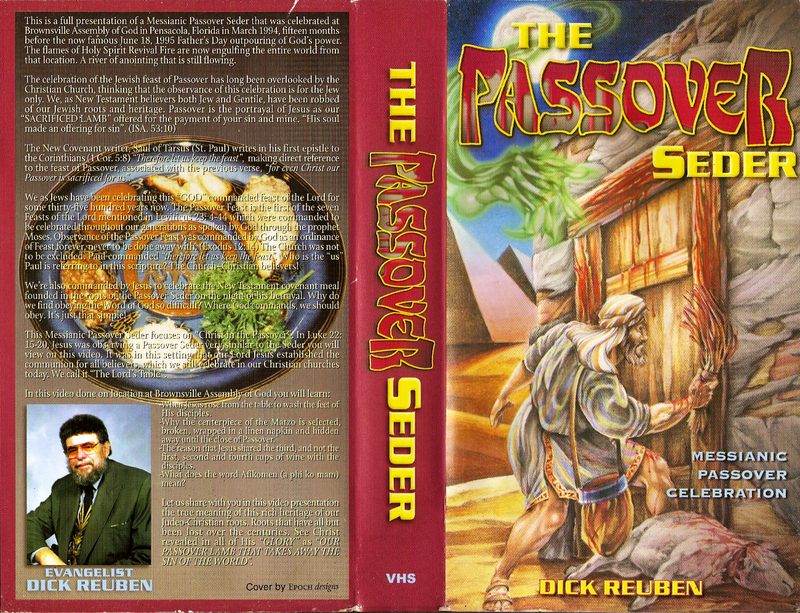 Basement of Ghoulish Decadence: The Horror of the Passover Seder! Not to sound like I'm discrediting one's choice of worship, but religious videos of any denomination often don't date well with time. The best titles are lurid exposés that scorn once popular media like hair metal or '80s horror as a scourge upon youths with hindsight making the targets seem innocuous today. They're mostly produced regionally or by mail order and in very small numbers. So when you come across an interesting one, usually for the wrong reasons, it's always best to pick it up. I found this one this morning, a video chronicling a Jewish Passover Seder, and I had to do a double take at the cover. The blood dripping down the title, the sacrificed lamb with its throat torn open, Jesus with the build of Van Damme slathering a door's edges with its blood, and a spooky green hand coming down from the skies. I had to stop and ponder "Is this a horror movie?!" upon first glance. The art looks more suited for a metal t-shirt! Well, the Old Testament IS pretty metal...in a Biblical sorta way.